In 1984, my grade school class and others of the same age throughout the area were given the task of creating a drawing depicting the importance of agriculture in our society. The drawings would be displayed and judged at the local McDonald's and winners would be presented with awards on a special night at the fast-food paradise. I won second place for my barnyard cartoon featuring a cow I completely copied out of one of those how-to-draw books. I'm a little surprised that I can't find the original drawing but I'm sure it's still around somewhere. Anyway, my prize was a McDonald's pen that looked exactly like this one I found on eBay, only mine was brown. More importantly, this snapshot of me accepting my ballpoint award represents the only image I have of the four cornerstone pieces of vintage McDonaldland decor I recall from my local restaurant. 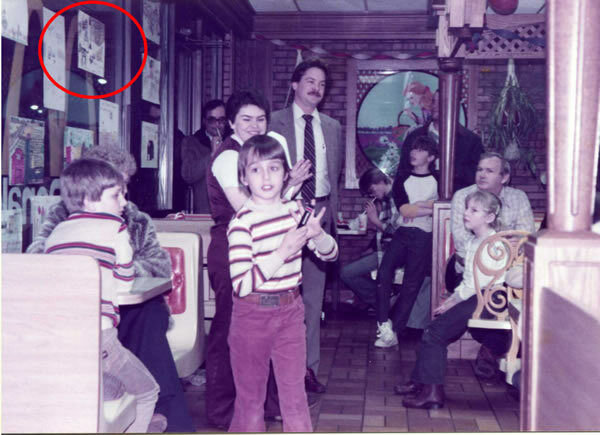 In each of the four corners of my local McDonald's were the members of what my brother and I always pretended were a family -- one corner was the mom gathering flowers (seen in the snapshot), one corner had a dad, another corner had a boy in a tree, and the final corner was girl. My brother would always get under my skin by telling me that he was the boy in the tree and I was the girl. Many years ago, the McDonald's in my town was remodeled and these corner images were removed. Being the materialistic and nostalgic collector that I am, it might be surprising that I don't want the actual wall prints of all four (although that would be amazing). I just want to see them again -- my dad, my mom gathering flowers, my brother in the tree, and me (the girl). That is some funky decor! Damn... I had those pens....they also came in white! I remember now...thanks for stimulating my memory bank Tim! What nostalgia.